Left to Right, Front Row: Owners Sara and David Loewen with their sons, Esther Loewen, Asenath Loewen, Maria Loewen. Back Row: Timothy Rempel, Joanna Loewen, Christina Pollard, Hannah Loewen, Tabea Loewen. David Loewen grew up with a love of growing things, inspired by his mother who immigrated from Switzerland. He began trying new varieties, and by age 19 he was selling extra plants. 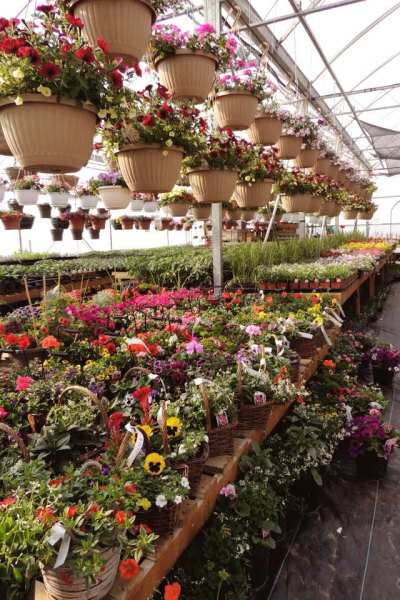 His business became official in 2001, and has grown to include 22,000 square feet of greenhouses! Now he and his wife Sara are raising their own boys in the business, and watching the delight in their eyes as they discover the joy of green growing things.